This weeks Bloggers Challenge was to make a card using this layout found on page 37 of the Spring Summer Collection 2008. If you'd like to play along with this weeks challenge leave a comment on this post with a link to your card. Very pretty, love the cut out flower. Great card Lisa. Love the colors. Have fun this weekend. Beautiful card Lisa!!!! Have fun, fun, FUN!!! Awesome card! I love the flower cut from designer paper! Very pretty......as I continue to stress on mine. Very pretty Lisa! I like how you cut out one of the flowers from the patterned paper. I like how your take on the layout changes the focus of the card -- so much better YOUR way! Beautiful! I love the cut-out flower as an embellishment. Your creative card certainly must win the challenge. So stunning! Very pretty. 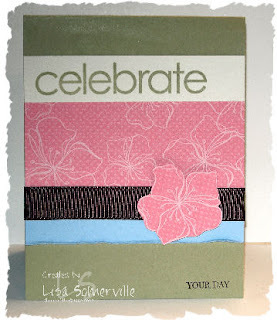 The cut out flower is such a nice touch to go along with our stamped flower background.